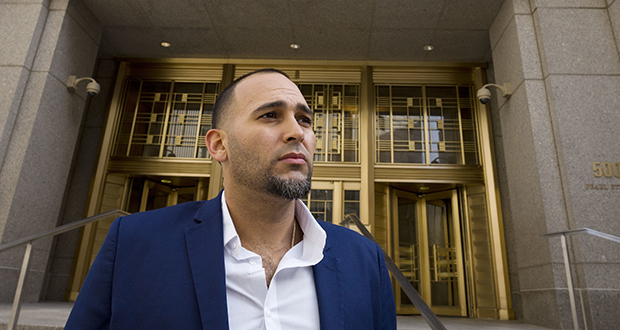 NEW YORK — Army veteran Jose Belen says the horrors of the Iraq War left him with post-traumatic stress disorder and the drug that helped him cope best with the symptoms was one his Veterans Affairs doctors could not legally prescribe: marijuana. The 35-year-old, married father of two is one of five plaintiffs in a lawsuit claiming that the government’s decision to classify marijuana as dangerous is irrational, unconstitutional and motivated by politics not hard science. Government lawyers were scheduled to argue Wednesday before U.S. District Judge Alvin Hellerstein in New York that the law is well-grounded and the case should be dismissed. Other plaintiffs include former NFL player Marvin Washington, the co-founder of a company that sells hemp-based sports performance products; a nonprofit organization called the Cannabis Cultural Association that helps minorities benefit from the marijuana industry in states where it is legal; 12-year-old Alexis Bortell, who takes marijuana to control epilepsy, and 7-year-old Jagger Cotte, who uses marijuana to treat a severe neurological disorder called Leigh’s syndrome. Poised and outwardly calm, Belen, who lives in Orlando, Florida, said he left a post-military career in insurance to found an organization called Mission Zero that works to end suicide among veterans. Medical research on marijuana has been sharply constrained by federal law, but Belen said he found it effective for taming PTSD symptoms while other medications pushed him closer to depression and possibly suicide. The lawsuit challenges the listing of marijuana as a Schedule 1 drug, a category that includes heroin and LSD. It names the Department of Justice, Attorney General Jeff Sessions and the Drug Enforcement Administration as defendants. The government argued in its Oct. 13, 2017, motion to dismiss the lawsuit that if the plaintiffs want the drug reclassified, there are other options, including an administrative petition to have marijuana rescheduled or asking Congress to change the law. Marijuana got its Schedule 1 designation as part of the ranking or “scheduling” of drugs under the 1970 Controlled Substances Act. The plaintiffs say marijuana doesn’t meet the Schedule 1 requirements of having a high potential for abuse, no medical use in treatment and no possibility for safe testing.